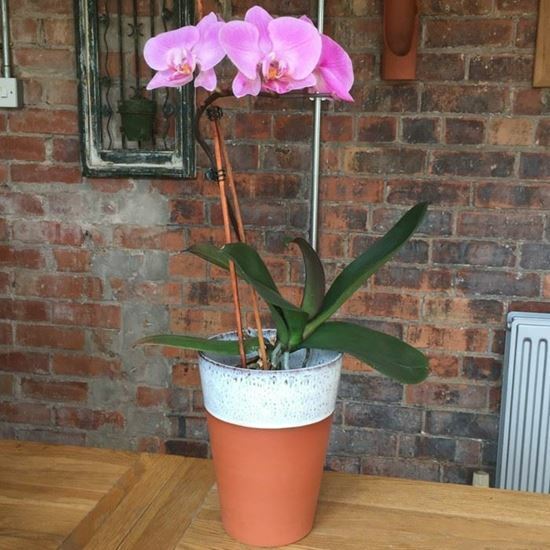 Designed for indoor use as a cache pot for containing house plants in their plastic pots our Long Tom has a glazed interior & no drainage hole. Simple in design with a glaze dipped top to complement the warm terracotta. Oyster glaze finish - The pot is hand dipped in two glazes which react together in the kiln to create unique effects with translucent white & shades of browns, greys & beige. Hand made in the UK at our pottery studio in Newark, Notts.